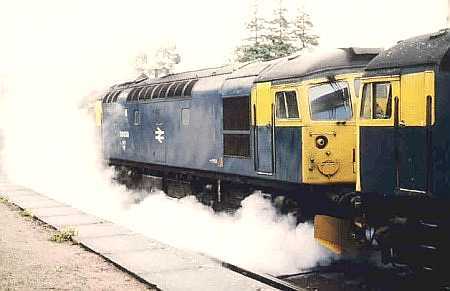 The last part of British Rail to employ steam heating on a regular basis was the Scottish Region. Generally anything with a working boiler would be used. Firstly a couple of studies, courtesy of David Hills, of a 'Solid Sulzer Railtour' and not an electric train heat equipped locomotive anywhere to be seen. Operated by the Wirral Railway Circle "The Orcadian" started out from Liverpool Lime Street with 47131, handing over to one of those awfully familiar Haymarket stars, 47273 at Edinburgh. 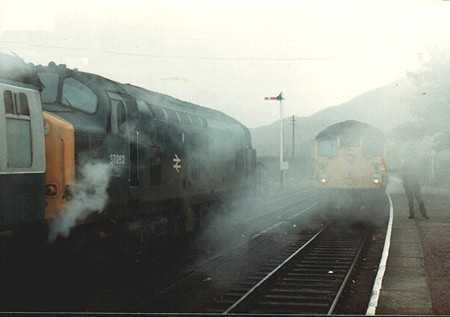 Arrival at Inverness saw 26015 and 26030 take charge for the run to Wick/Thurso and back. Even 26038 joined in the fun by performing the hounours with half of the train along the Thurso branch in the very far north of Scotland. 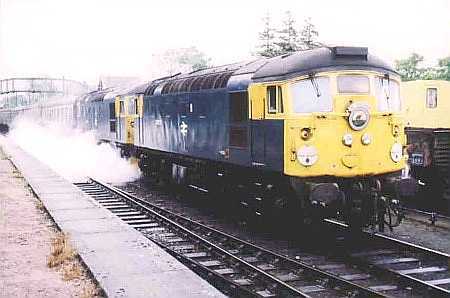 The same Class 47s performed on the return journey. 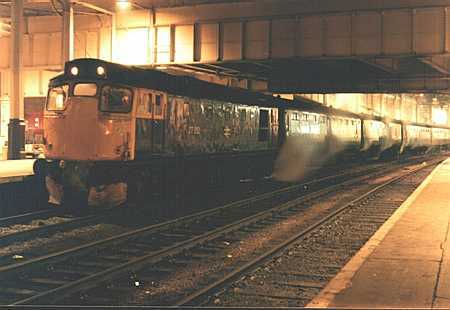 47273 became 47627 whose recent claim to fame was to haul a special promotional train around the country for those Mars Bar people whilst 47131 was scrapped in 1988. Of the 26s 015s fate is currently unknown, 030 was scrapped in 1987 and 038 is in preservation. Two views of the tour at Tain with 26015 leading 26030 (above) and below a closer look at why the train may have been a touch cold even on June 7th 1980!!!!! More northern delights as 26034 arrives at Achnasheen on 9th October 1982. The signalman is on the platform awaiting the single line token from the driver of the 26. This will then pass to the driver of 37262 who would have been carrying the next token for the 26 and its train. Probably the last year of regular steam heat was 1986, here 27052 simmers the 0715 Edinburgh - Dundee at Edinburgh Waverley on 15th February 1986. Click HERE to return to my Contents Page.